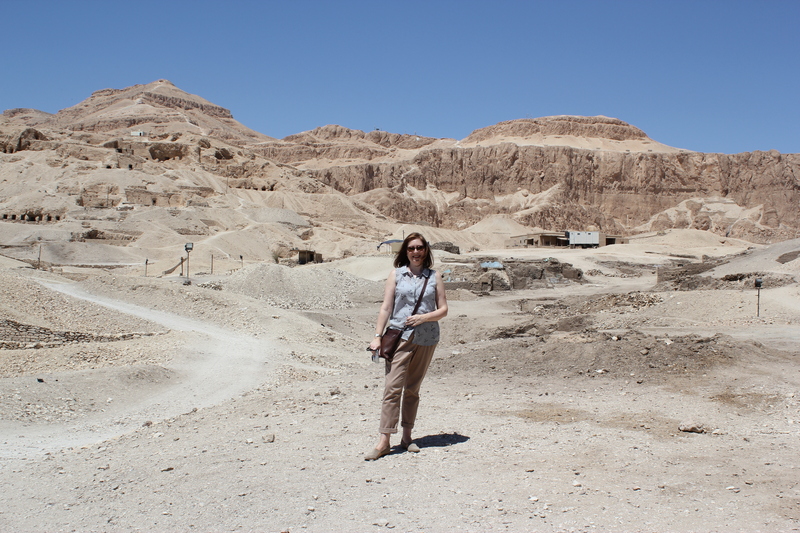 One of the highlights of my trip to Luxor was the chance to visit some of the little-known Theban Tombs. They riddle the Theban Hills like a mountainous Swiss cheese. According to my guide book there are thousands of them, although only a handful are open to the public with a ticket purchased from the ticket booth near the Colossi of Memnon. 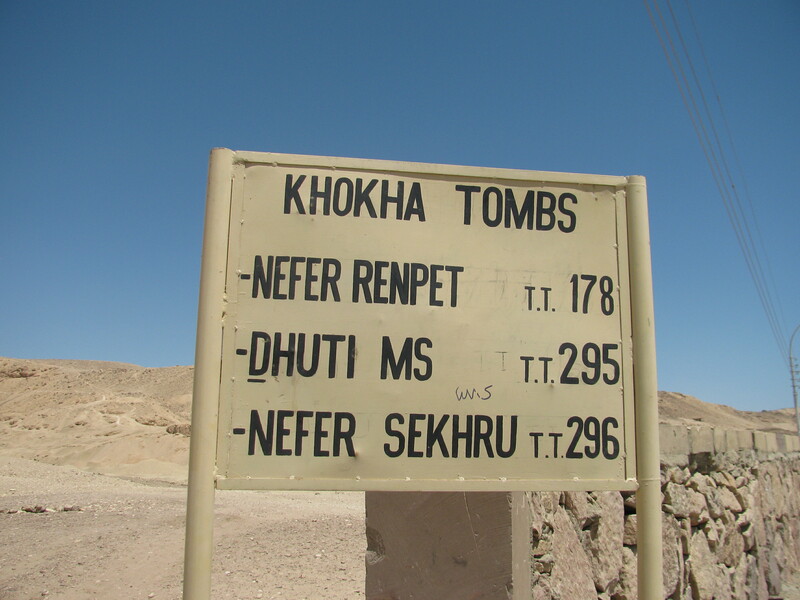 I visited the three tombs of El-Khokha. 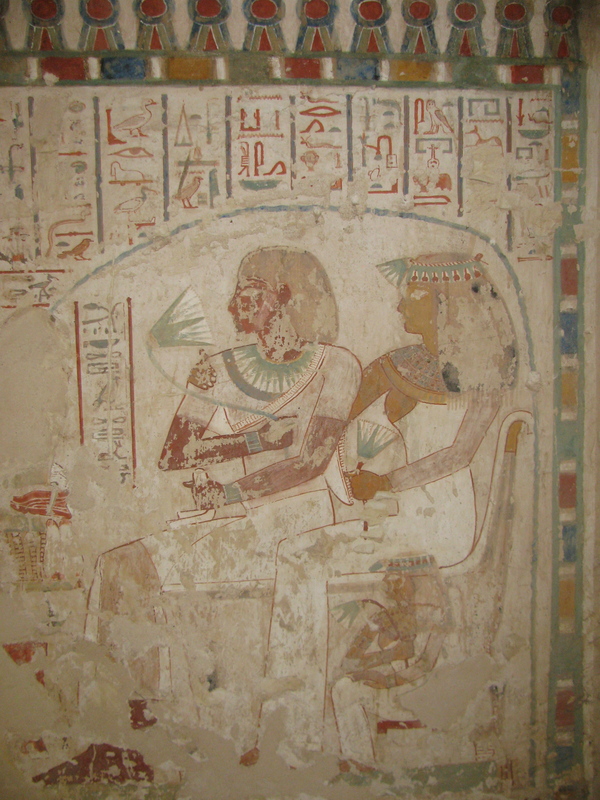 The tomb of Dhuti is unusual for containing seated statues,presumably images of the deceased tomb-owner himself, gazing over his grave goods. and would presumably have known each other. 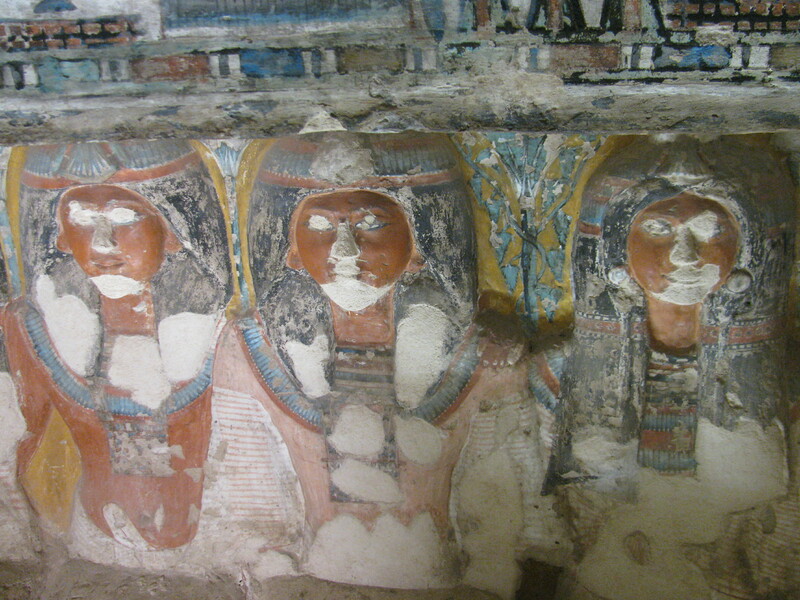 It’s tempting to see thrm trying to out-do each other with their tombs. Both bear their original paintings, the colours remarkably preserved considering the passage of some three thousand years. 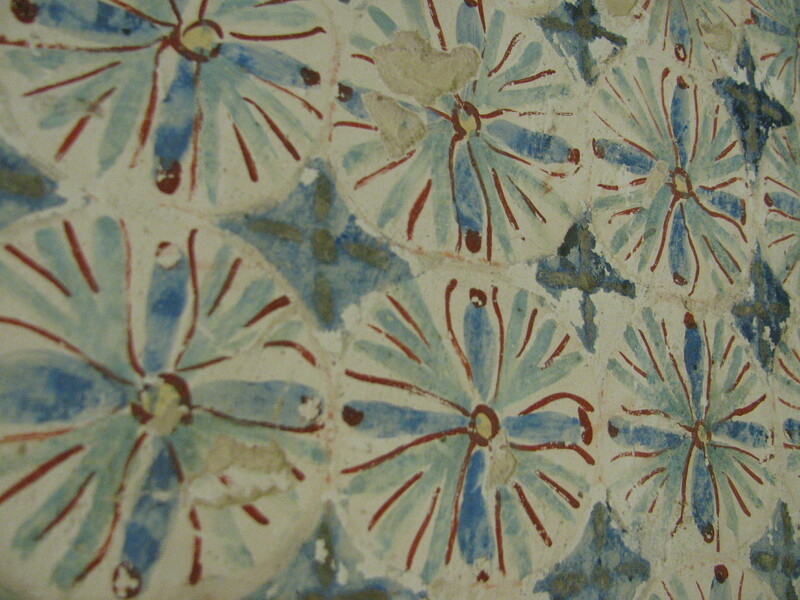 Nefersekhuru’s tomb has a beautifully painted geometrically patterned ceiling, shown here in the photograph. The Theban tombs show us a slice of real life that’s not so easy to glimpse in the royal tombs, which are laden with religious iconography. These are the houses of eternity that you or I may have chosen for ourselves, had we happened to live in dynastic Egypt and boast a reasonably good job. Here’s just a selection of the scenes. The guard on duty was more than happy for me to take photographs in return for a little baksheesh. I switched off the flash of course. Do visit if you ever get the chance. These wonderful little sepulchres are not to be missed. 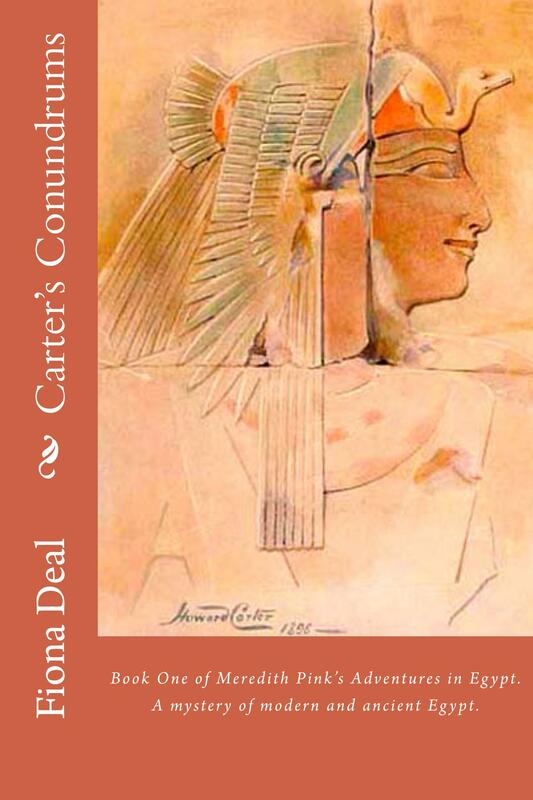 Author of Meredith Pink’s Adventures in Egypt. Posted on May 15, 2013 by Fiona Deal. 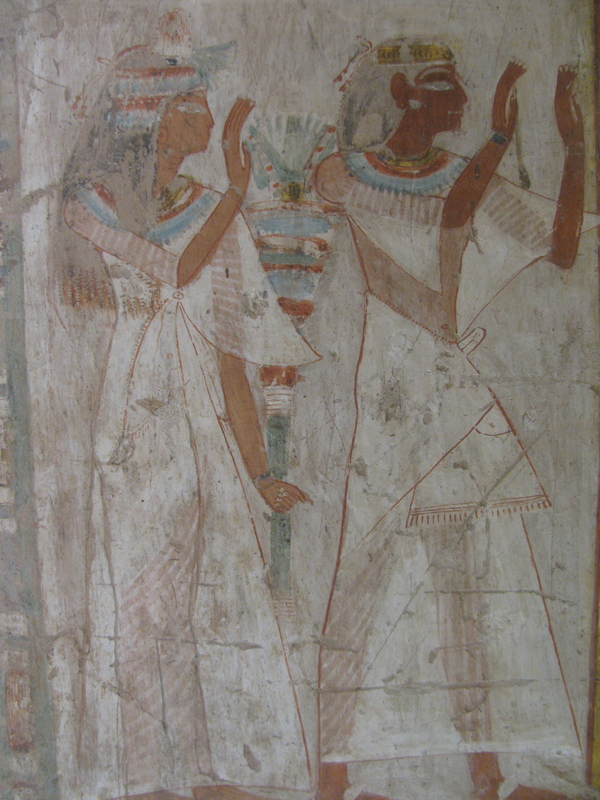 This entry was posted in ancient Egypt, Egypt, History, Travel and tagged egypt, El-Khokha, Luxor, Tomb. Bookmark the permalink. It is my pleasure to be a merber in your biog, and thank you so much that you allow me to share the article, it is my true feeling that I want to share this with others. Thanks again for everything, but most especially your friendship. Saved as a favorite, wonderful site!